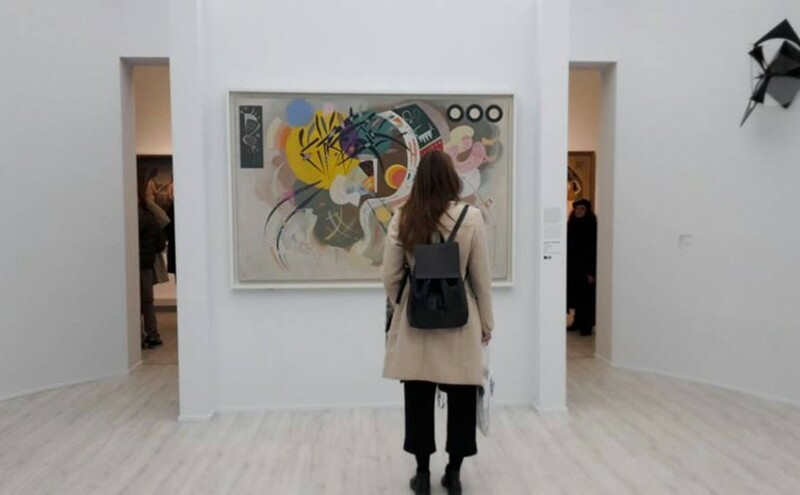 An unmissable chance to see the Guggenheim collection in Italy: Constraint Magazine attended the Palazzo Strozzi’s opening exhibition “From Kandinsky to Pollock, The Art of the Guggenheim Collections” in Florence. Palazzo Strozzi, outdoor detail. Photo by Jenny Stelmakh. Constraint Magazine continues its tour in the Italian overview: it moves, investigates, picking new ideas to enrich his experience and, we hope, those of our readers. Today we want to describe our experience in Florence, where we are for an exhibition’s opening, a major exhibition starting on Saturday, March 19. We’re at Palazzo Strozzi, an historic palace of the Renaissance and an exceptional location, specifically chosen to host some of the works of the Guggenheim collections. The exhibition is the result of a collaboration between the Palazzo Strozzi Foundation and the Solomon R. Guggenheim Foundation in New York, which presents more than 100 works including European and American Art, from the twenties to the sixties of the twentieth century. The exhibition’s uniqueness is not only guaranteed by the unquestionable importance of the works or the exceptional names, cornerstones of the avanguards of the twentieth century. The exhibition creates a thread, a story with images, a network of narratives that describe the life and passions of Peggy and the uncle Solomon, the biography of the artists, their relationship with collectors as well as the development and maturation of the art in the season of the avantgarde. The story tells about an eclectic uncle and an ambitious nephew linked together by the taste and love for contemporary art: the story of Solomon and Peggy Guggenheim, the bulwarks of modern art patronage. That’s right. The patronage of the past, the one of Florence during the Renaissance, from Cosimo “Il Vecchio” to his nephew “Lorenzo il Magnifico”, that blends and takes on a new role and recurs to our eyes. Different artistic movements are then confronted: the masters of modern art (from Marcel Duchamp, Max Ernst, Man Ray, Pablo Picasso), informal art (Europeans informal as Alberto Burri, Emilio Vedova, Lucio Fontana, Jean Dubuffet) until American art of the fifties and sixties (like Jackson Pollock, Mark Rothko, Willem de Kooning, Alexander Calder, Roy Lichtenstein, Cy Twombly). Roy Lichtenstein, Preparedness, 1968. Photo by Jenny Stelmakh. The exhibition takes place in nine rooms: in addition to the Guggenheim collections room, the second room has particular importance on the relationship between the two continents, “Europe and America”. This room tells us about the new avant-garde birth; then continue in a space (room 3) entirely dedicated to the artist Pollock, strongly supported by Peggy. The journey between the images leads us then in the 4th room, dedicated to abstract expressionism (especially important the works of William de Kooning); then along the 5th hall dedicated to the new trends in the 2nd post-war scenario; the hall 6, however, is the one that opens the season’s exhibition at the Guggenheim Collection in Venice at “Palazzo Venier dei Leoni” (at the end of World War II, Peggy bought Palazzo Venier where he decided to open one of his private collection to the public). Going beyond the magnificent room 7 entitled “the great American painting”, the next room consecrates the iconic figure of Mark Rothko (Peggy was a great admirer, so much so to dedicate an exhibition at her gallery called “Art of This Century”, around the middle of the Forties). The tour ends in room 9, entitled “The sixties. The beginning of a new era “: in this room you can admire one of the greatest works of Lichtenstein, “Preparations” which opens a new art period, the Pop Art. Jackson Pollock, The Moon Woman, 1942. Photo by Jenny Stelmakh. An itinerant journey. Entering the first room (Room 1. Guggenheim and their collections) there are some of the works presented in an original and at the same time familiar scenario. The feeling is in fact to be in the spaces of the two New Yorkers collectors: on the left is presented a picture from the “Art of This Century” show, the Peggy’s museum / gallery opened in 1942, while to the right there’s a photo of Solomon R. Guggenheim Museum, an internationally renowned place, known by everybody. The observer is brought into a spatial and temporal dimension far away from reality, certainly imaginary, but that somehow brings him closer to the Peggy and Solomon’s life spaces and places. We believe this is one of the most significant features of the exhibition: it encourages the visitor to produce with a bit of imagination a credible scenario that in some way creates a bond, an intimate relationship by perceiving that sense of closeness to the taste and passion of both collectors. Thanks to this travel with the imagination, we can project ourselves into Peggy’s living room, while she cuddles her Pekingese Twinkle, sitting on her sofa, maybe enjoying the discovery of a new artist with the uncle Solomon. Both seduced by the beauty surrounding them, never satiated by art and newness, always curious and inspired to amaze and surprise. Vasilij Vasil’evič Kandinskij, Dominant Curve, 1936. Photo by Jenny Stelmakh. In the same days of Palazzo Strozzi’s opening exhibition a new documentary on Peggy Guggenheim’s life is being released, directed by Lisa Immordino Vreeland. One more opportunity to learn about this emblematic figure of the twentieth century. Advance sale charge per ticket (excluding schools) is €1.00.